The Dream Whelpling is a wild pet that spawns at the end of the Emerald Nightmare raid, after Xavius is defeated. This pet does respawn after a short period of time. Bites the enemy with Emerald teeth, dealing 413 Magic damage. As a double-counter, Dream Whelpling (P/P) obliterates flying pets. Emerald Bite+Emerald Presence+Healing Flame is my go-to setup. Predicting when you're going to take a big hit so you can counter with Healing Flame improves its already decent value. And with 341 Power, Emerald Presence provides incredible survivability vs any multi-hit or dot opponent. The Passive can continually proc each time you land a non-passive-boosted hit on a target below 50% - use this to maximize damage. To get to the area where the whelps spawn you need to defeat Xavius, the final boss of the Emerald Nightmare raid, but you can do this on the 10 man normal setting. I used a level 120 Blood DK (349) to solo. My capture team was Bonkers (or Kun-Lai), Terrible Turnip, and leveling pet. Bonkers absolutely destroys the whelplings, so be careful to switch to your Turnip for the whelpling you want to catch. Also, this is a great place to level pets or your character through pet battles. These are in homogenous groups of 3 so you get 3x chances for rares each battle. There are enough nodes / fast enough respawns so you can almost battle non-stop until you find what you want. I picked up a blue P/S and P/P in about 1/2 hour. These are low damage + heavy heals / damage mitigation. They can be a little annoying with how slow it is to kill things. You can get this after raid finder, so no need to clear the whole raid (unless you want to lol). Don't worry about trying to hurry, you won't get kicked out of the instance. Very easy to find a rare one since each battle is just 3 Dream Whelplings, mine was an add-on to a poor quality. Easy battle, but does heal itself quite a bit. Was able using a Erudite Manafiend (25), Mist Fox Kit (24), and Ban-Fu (19). This guy is basically my second Emerald Proto-Whelp. Identical stats and i also use the same moveset: Emerald Bite, Emerald Presence and Emerald Dream. With emerald presence, he takes a lot less from dot damage and multi hit moves, and with healing flame/emerald dream you can go back up to full. Emerald dream is a sweet ability, but I dont actually find myself wanting it over healing flame because of the lack of ancient blessing synergy. This should be rated higher for combat - it has identical stats and almost the same move set as the Emerald Proto-Whelp, which is rated as #9 overall in battle. Emerald Presence and Emerald Dream make this pet an excellent anchor to any team. Pet classes can have trouble starting a battle with the Dream Whelplings. If you're getting the 'Failed to create pet battle.' error, dismiss your pet, and try again. Just an FYI, these pets also spawn after killing Xavius in LFR. 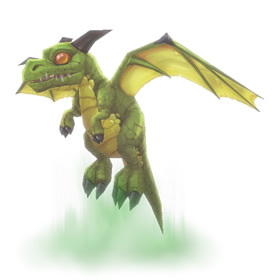 Absolutely adorable, this little guy is also pretty good in battles, having the same stats and similar moveset as the emerald proto-whelp. However, this is arguably easier to obtain if you want a specific breed, personally I was looking for a P/P. To find a proto whelp you have to look around for a while, the dream whelplings are everywhere in the emerald dream after defeating Xavius and you can always ask a friend to let you in if they finished the raid and you didn't. I can confirm from previous posters that this guy drops once you beat the final boss in The Emerald Nightmare Raid. I got mine from the normal lockout that my guild finished. It also seem ot have a quirk to be summoned at different sizes each time you get it out as the one I caught was a lot larger than a guildy of mine's were. It is also tamable in all rarities so maybe keep a battle stone available. I did not spot it on the pet battle tracking, so you might have to look around to see one. Find someone with a completed lockout and you can acquire this pet. Once you zone in jump down the... maelstrom?... and you'll get to a clean and green section of the Emerald Dream with whelps all around. Think I saw five spawned with three whelps per battle, so high chance you'll find what you want. Also it's nice to have an easily accessible P/P whelpling with the Emerald Whelpling moveset. Without question one of the best battle pets around, especially against flying pets. Confirming! After you beat xavius you can get him, very cute! Tamable by all classes in the final area of the Emerald Nightmare raid after defeating Xavius!